In 1967, Peter Drucker said that the computer is “the computer makes no decisions; it only carries out orders. It’s a total moron, and therein lies its strength. It forces us to think, to set the criteria. The stupider the tool, the brighter the master has to be—and this is the dumbest tool we have ever had” (p. 1). In 2014, Dewhurst and Willmott said there are “impressive examples of machine learning substituting for human pattern recognition—such as the IBM supercomputer Watson’s potential to predict oncological outcomes more accurately than physicians by reviewing, storing, and learning from reams of medical-journal articles” (p. 2). New technology brings new opportunities, and we should not be too quick to assume that current limitations will last. Applicant Tracking Software, or ATS, is rapidly becoming a worldwide recruitment standard. Sometimes known as a talent management system, ATS is essentially a specialist customer relationship management system which handles, for the recruiter, employer job applications, selection and hiring. It is the organisation's central recruitment database; it partners with job boards to get the hiring ads out there, and stores the applications that come back. The databases have some built-in specialist tools, including specifically artificial intelligence (AI) and natural language processing (NLP) for intelligent guided 'semantic search'. One of the clever things the software does is look for key words in the applicants’ documents – CVs, forms and application letters – when they are uploaded, seeking to match the job description specs of the jobs being applied for. The ATS then provides the recruiter a list of matches who get to the next stage (whatever that stage is - interview, secondary screen on different criteria, etc). If there are insufficient keyword matches, and the applicant doesn't go through to the next level. ATS development has largely been driven by two factors. The economic downturn - there are so many people out of work, there needed to be a better way to manage so many applications for companies flooded with desperate applicants - and the AI algorithms have reached a level of sophistication that enables this to work. As The Resumator says, "the right ATS can give recruiters their time back, once stolen by the overwhelming demands of finding, handling and evaluating piles of resumes" (29 May 2013). Recruiters need only read the CVs of those applicants who match the desired job criteria. The cost of proprietary software has been a barrier to entry since the late 2000s, but since the 2010s, software packages are following Moore's Law and is getting cheaper and more versatile very quickly. There are a number of open source and freeware alternatives already (Medved, 14 November 2013; phpBB Group, n.d.). In the US, many LinkedIn groups and career-oriented blogs appear overly preoccupied with reporting what ATS won’t do. The list of ‘do nots’ includes not using headers and footers, not using tables, not using pdfs, not using anything but non-serifed plain fonts, not using fonts of different sizes, not using a functional CV format, not using colour, not using lines, and repeating material (Boyer, 2014; Young, 2014a; Young, 2014b; Hein, 2013; Slack & Bowitz, 2013; Soto, 2013; Poole, 2010). 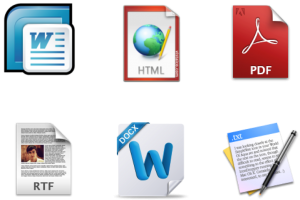 Pdf is a standardised format so is readable across all operating system platforms. The original document formatting is kept, so conversions from Mac Word to Windows Word does not cause unprofessional-looking formatting errors. Pdf files are compressed, so require less bandwidth to email or upload. Pdf files cannot be changed, so – from the applicant’s point of view – are more secure. The difficulty is that it is thought that ATS does not parse pdfs correctly, so candidates' CVs, if they send in pdfs, won't get into the "pick me" list. However, from the short time I have spent looking at the workings of an ATS, I think this assumption is incorrect. Pdfs seem to show up with the same regularity as Word documents, and look the same on screen. As I have previously reported, I am currently in talks with a recruitment company to try and determine how we can run some experimental comparisons. The aim is to set up a dummy job application and then run some CVs through the system in different formats, while using exactly the same information. Then we will know if pdfs or headers or footers or anything else will actually affect how a CV works against ATS keywords. Once I we get underway with the experiments, I will report back. Keep watching this space!